It Works For Me. Kate Field Shares Her Personal Writing Rules. This week I am delighted to welcome Kate Field to my blog. 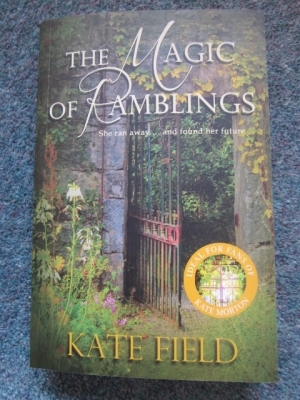 Kate's debut novel, The Magic of Ramblings, was recently published by Accent Press and if you read my blog last week, you'll know that I found page 1 captivating - and I have to tell you that page 1's promise held up all through the book. Kate is here today to tell us about her writing process and the rules she tries to follow. Welcome, Kate. Thanks for joining me. Thank you for inviting me to your blog, Susanna! This should have been a simple post to write. In every day life, I’m a stickler for following rules. I adhere to speed limits, won’t go to the express till in the supermarket if I have more than ten items in my basket, won’t cross the road until the green man lights up.... You get the idea. But... my writing life is completely the opposite. I don’t want to be tethered by rules. One of the many reasons I love writing is that it gives me the freedom to escape from all that and to do whatever I want. So I’m not going to encourage anyone to follow rules, and instead these are a few lessons I’ve learned so far that work for me. I can’t start writing until I know the full names of the main characters – and they have to be the right names. I once tried to write a short story and struggled to move past the first page. Changing the name of the heroine solved the problem: she took on a new identity with her new name, and I understood where her story needed to go. I spend a long time mulling over names. I usually start by looking on the internet at the most popular baby names for the years around which the character was born. Other good sources are TV credits, newspapers and magazines. I don’t tend to include long descriptions of characters or places in my writing, but I need to have a clear picture in my head of what they look like. I use Pinterest boards to save photos that inspire me for each book. I set up a board before I start writing, and add to it as I go along: sometimes if I’m in a writing slump, it helps to spark my imagination again if I go back to the pictures. Here’s the link to my Pinterest board on The Magic of Ramblings, if anyone would like to see some gorgeous Victorian Gothic architecture and handsome bearded men! Ouch. That still hurts. It took me a long time to read on and understand the explanation. I’d thought of what I considered a funny scenario, and dumped my characters into it. But they didn’t belong there: the characters I’d created would never have behaved in the way I’d forced them to do, and so the whole thing fell flat. It was a valuable lesson: characters come first, and they direct the story, not me. This leads on from the last point. There are talented writers who can turn their hand to anything. I’m clearly not one of them. When I accepted that romantic comedy wasn’t my strength, and started writing more serious love stories, it felt like I’d come home and settled down in my comfiest slippers. My writing improved and I enjoyed it more. Don’t feel guilty if another writer manages 5000 words before breakfast, and I can only squeeze out 5 lines all day... Don’t feel guilty if I come home from work so mentally exhausted that I can’t write at all…or if the sun makes a rare appearance and I go for a walk with the family instead of carrying on with the WIP…or if I have to finish the brilliant book I’m reading rather than write. Writing a book can be hard, so be kind to yourself while doing it. This is such an interesting post. Thank you, Kate and Susanna. Like you, I like visual inspiration and love the idea of all your images on Pinterest. What a great way to re-inspire your imagination when necessary! Congratulations on the publication of 'The Magic of Ramblings'. Do you think this means we all have permission to let the dust build up, Jen?! I agree with you wholeheartedly about the importance of finding your writer's voice. It took me a long time to discover mine. There was a glitch with my intended edit. Meant to say, like "that" pair of slippers. My feeling about discovering myself as a writer mirrors yours. So many of your 'rules' resonated with me, Kate. I feel ever so much better about the dust on my furniture now! On a more serious note, knowing who you are as a writer is crucial. I spent much time trying to figure that one out. However, once I found my writing voice, the sense of comfort and cosiness was like a pair of favourite, well-worn slippers. I'm glad you feel you can identify with Kate's rules, Patsy. Being true to the characters is essential, of course. I especially agree with the first point Kate made in her list of things not to feel guilty about, ie don't feel bad if another writer churns out far more words. It isn't a competition. Thanks for commenting. These seem like excellent rules to me - especially the ones about characters coming first and not feeling guilty. I agree with you, Louise - characters should always act true to their personalities. I'm glad you're going to read The Magic of Ramblings - I can thoroughly recommend it. I was interested to read what Kate said about initially wanting to write romantic comedy, only to find that her stories weren't funny because she was pushing her characters into doing things that didn't come naturally to them. It does show when characters are forced into doing what the author wants because s/he has certain ideas regarding the plot. Kate has clearly learned a lot about herself through her writing and I will add her book to my reading pile. What a pretty cover!